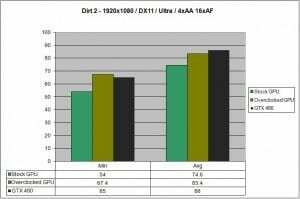 Today we will be looking at the highly anticipated first DX11 offering from NVIDIA: the Fermi/GF100, better known in the retail chain as the GTX 470 and GTX 480. 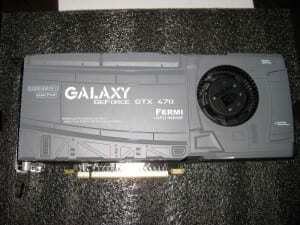 More specifically, we will be looking at the little brother of the two, the GTX 470. Sites with pre-release cards published their reviews on the NDA expiration date of March 26th and the cards themselves were available to the public on April 12th. The public’s reception of these initial reviews was a mixed bag. Sure, the 480 may be the fastest single GPU card out there in most games, tests, and resolutions, but at what cost? 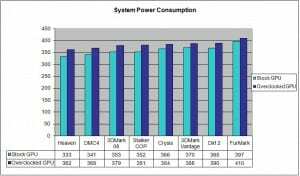 Higher power consumption? High operating temperatures? A loud fan? The short answer is: yes. However, you may be a bit surprised with the results I found when using the 470. 448 Cuda Cores with 34B/sec texture fill rate and 1280MB GDDR5 on a 320bit bus with 133.9 GB/sec bandwidth. 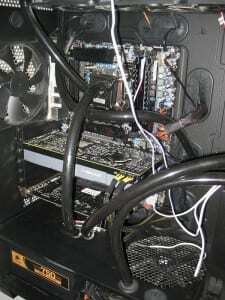 GPU Speed: 607Mhz, Shader Speed: 1215MHz, Memory Speed: 1674MHz. Up to 32xAA for a single card. For more details you can go to Nvidia’s website. I have chosen to show in-game performance on one specific and fairly common enthusiast resolution: 1920×1080. 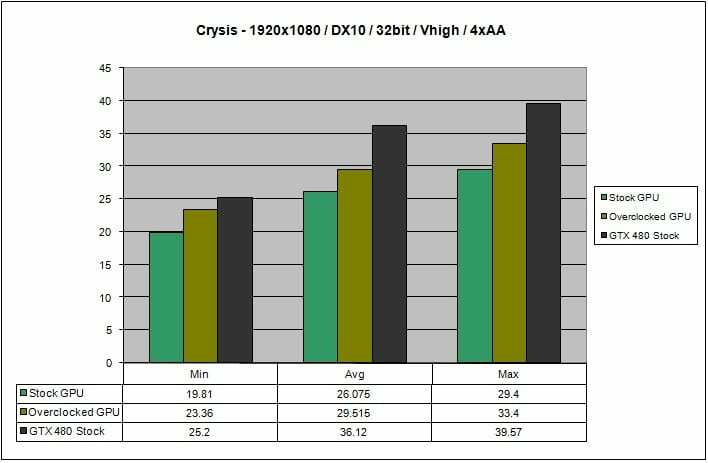 Synthetic benchmarks are often CPU-limited because of the low resolutions they run at by default, and tend to not reflect modern gaming performance. Regardless, many people want to know how it does in those tests, so results for these benchmarks will be included after the game benchmarks. 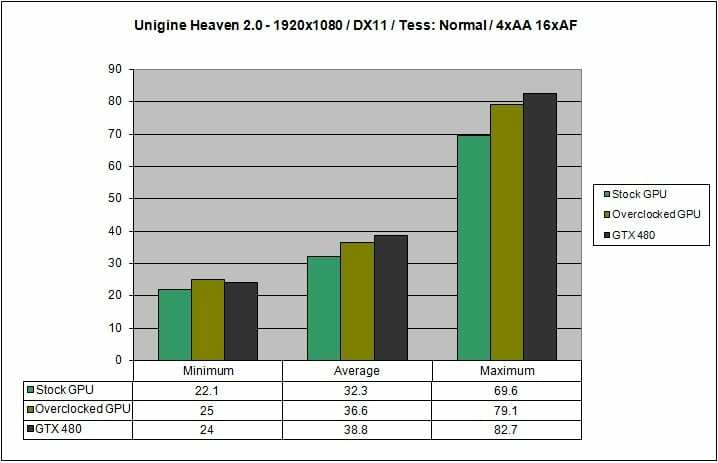 Some of the game tests have a stock GTX 480 results added in for comparison. 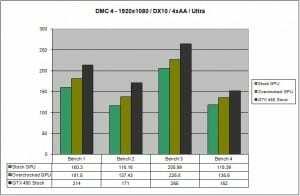 A special thanks goes out to Zantal for taking the time to run these benchmarks to add to the article. 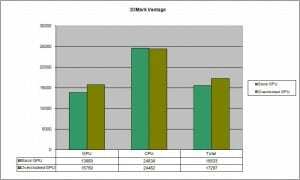 His system is similar (i7 920 running at 4Ghz) to mine so the results he provided while not a direct “apples to apples” comparison, should give a general idea of the performance difference one would see between the two cards at the settings listed above. 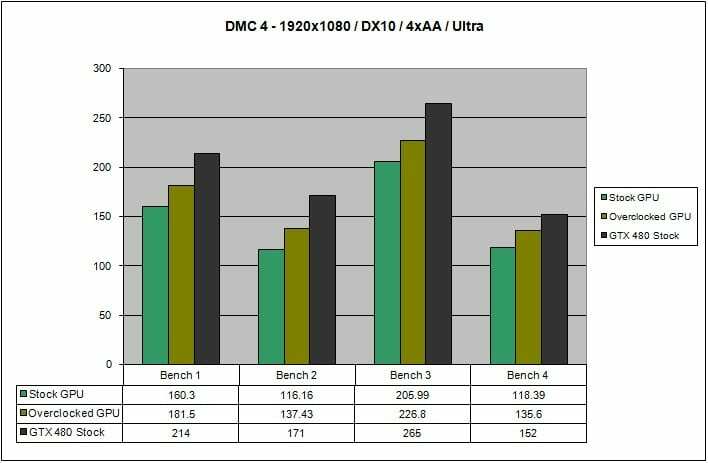 All benchmarks were run with in-game benchmark software so the results are repeatable and consistent. 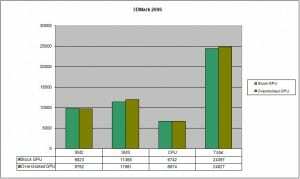 All GTX 470 tests were run a total of 3 times, averaging the scores for the final result. Overclocking has just been made a bit easier again for NVIDIA cards. When you overclock GF100 cards, the shader and core speeds cannot be separated like GT200 cards and previous generations dating back to the G80 cores (think 8800GTX). You can only overclock the shaders and with that the core raises which runs at one half the shader domain value. Using the newest release of Afterburner (Beta 5), one can now adjust the voltages on the GTX 470 and 480. This should please the extreme crowd I’m sure. For the record, I was able to adjust the settings to 775/1550/1800 on the stock voltage of .950 and have not added voltage to it yet. That’s a fair amount of headroom all the way around. As can be seen from the chart below, the amount of power used may pleasantly surprise you. 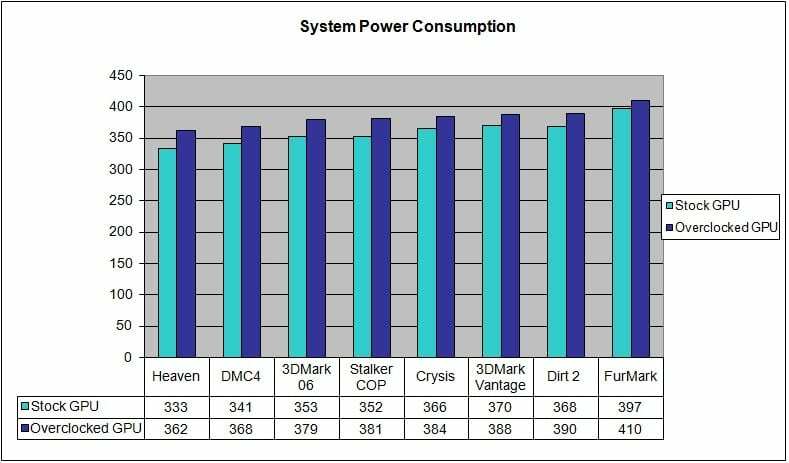 My total system consumption which includes my water loop with a pump and three high- power Panaflo fans, as well as a 4Ghz overclock on the CPU, never peaked above 400 W while gaming. Futuremark managed to push the system past the 400 W mark. Most of the games averaged about 20 – 30 W less. All data in the chart below are peak power numbers. All wattage readings were taken from the wall with the Kill-A-Watt device. For a quad i7 with HT (or greater), I personally wouldn’t run anything less than a quality 550 W Power Supply with a minimum of 40 A on the 12 V rail to allow for quiet operation and not run the Power Supply in the red. 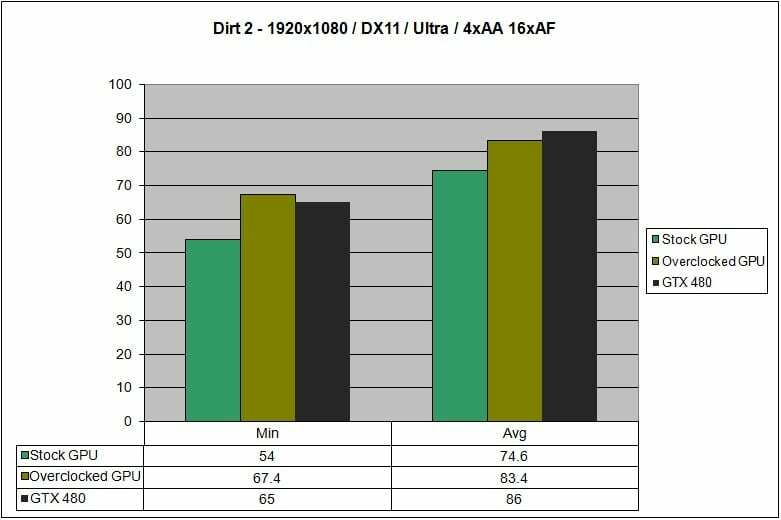 For other information on the power needs of SLI/Tri/Quadfire, please check slizone.com. Most reviews from other websites show temperatures sky-rocketing into the 90’s and above. I am certainly not doubting their results as I have also seen these temperatures. However, I would like to note that I believe those temperatures were achieved with the fan set to auto and no changes made to the auto profile, as that is the only way I reached those temperatures aside from accidentally leaving the fan set on 40% manual, in which I was seeing temperatures of over 100ºC! For the record, the card didn’t even flinch until 110°C when my PC promptly rebooted. When performing these tests, I manually set the fan to 75%. Ambient temperatures were within 1°C for all testing, and the starting idle temperature was 47°C (which is about my idle temperature @ 50% fan with similar ambient readings) before all testing. If you are a big fan of a quiet PC, this card will not fit that bill with the stock heatsink and fan and would need to be water cooled. It is louder than I would want it to be, but is not overwhelming when inside a closed case. Of course your mileage may vary, but I would have to imagine with the testing environment being a not-so-friendly-to air cooling case, most results should be the same or perhaps better. Please note the GTX 480 temperatures listed here were with the fan set to auto. There is no doubt this is one fast, hot, and power hungry card. 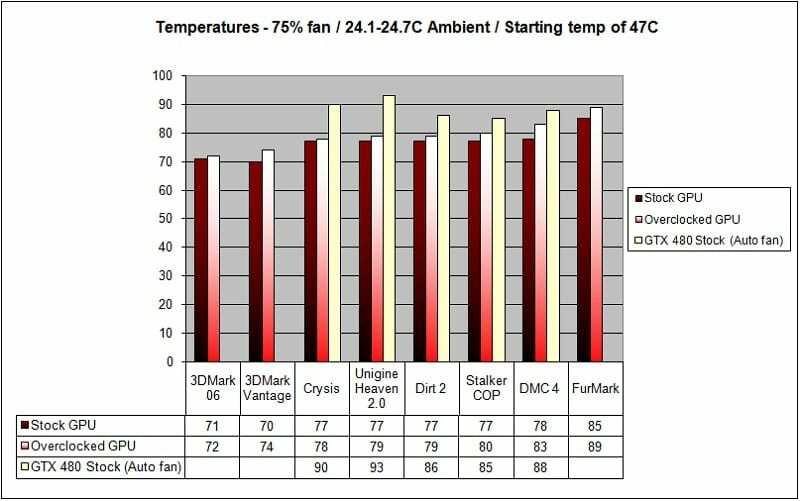 But when the fan is set manually to around 75%, temperatures do not creep into a questionable area for the card’s safety. 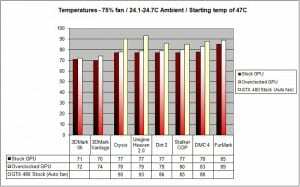 But if you are used to earlier NVIDIA cards or most ATi cards for that matter, the 80°C+ temperatures may come as a surprise. As I noted earlier, the fan at 75% is loud, but not unbearable and not heard over a game, music, or headphones when inside a closed case. 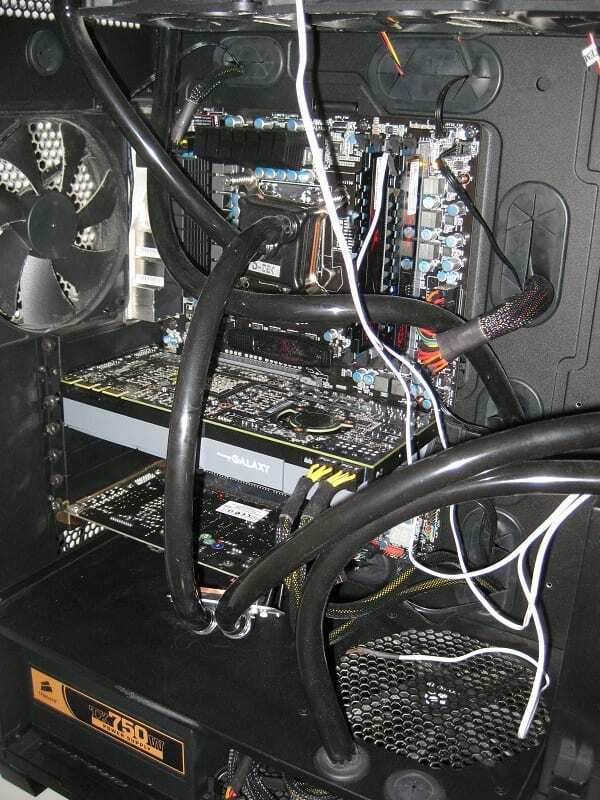 When the card is idle and set at 50%, I cannot hear the fan at all and temperatures even inside a case optimized for water cooling and not air, sit around 47°C with an ambient of around 24-25°C. If you are not into manually adjusting the fans when you play games, MSI Afterburner Beta 5 has the ability to set by temperature when your fan spins up while under automatic control. My games have never looked better with the copious amount of AA I can pour into every game at my resolution of 1920×1080. My games have also never run smoother, not that it was ever a problem with my old GTX 285. There is plenty of horsepower under the hood of this mean machine. Although a direct comparison of image quality was never made, if there were any differences, I did not notice a difference between this and a GTX 285. So this begs the question: what video card to get? Should I get this over the 5850? Those answers are actually pretty complicated as it depends on your needs, wants, and tolerances. If you participate in Folding@Home for example, a GTX 470/480 would be the way to go as it has been rumored to be much faster over the previous generation cards and NVIDIA cards have always performed better than ATi’s offerings (for now) on that platform. Note that, at this time, Stanford have not released a stable client available to the public, so just hang in there. If Folding@Home is not a consideration, it comes down to cost and gaming performance. The GTX 470 does appear to beat out the 5850 in most tests by 5-10% and loses in a minority of others by about the same margin (depending on where you look, what was tested, etc. ), however it will cost you about $40 more. One can find the GTX 470 priced at its MSRP of $349.99 and up and the ATI 5850 at $309.99 or more at newegg.com. Then there is noise – its very subjective. The level of noise one person may tolerate may to another sound like a jet taking off. 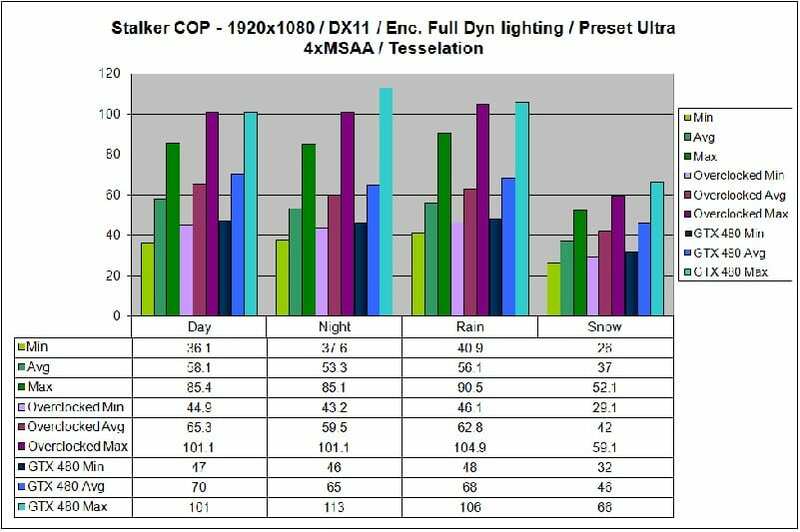 The noise levels have been more accurately measured in this anandtech.com review. The bottom line is that it’s up to you. It only benefits you to be an educated consumer and juggle each card’s nuances in your own head and make an educated decision. Good luck, and happy gaming, folding, or benching! Next Article Computers: Toys or Tools? 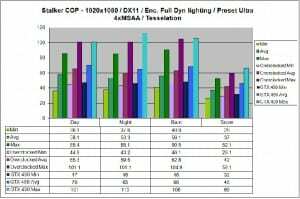 Curious how much higher you were able to get the core with higher voltage though, and how the results looked compared to stock and your 775 core overclock. OMG there is my name!!! Awesome review man, good work. tyvm much all!!! And dont forget to give Zantal his props as well!!!! I pushed to 800/1600 with 1.0v...and havent tried further... I will report back though when I see. Hopefully she will be under water soon and the cooler temps will yield a better overclock on the shaders/core. 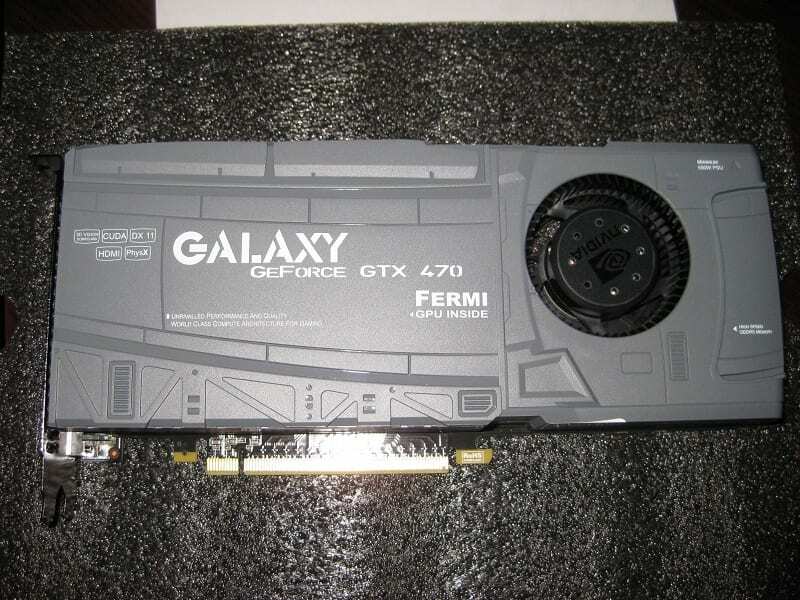 This is the card I hope to get to replace my 280 GTX SLI. I want two for the three monitor setup I hope to buy around xmas. I think these will be plenty enough I hope. Whats your thoughts on waiting for a die shrink and always the problem of finding a standard card for a full cover block? Is it worth waiting for a die shrink or should I just do it now because of card changes and waterblock incompatabilities in the future? There are already full coverage blocks out and available at our favorite etailers, so that shouldnt be a worry. However with a die shrink, it may not fit. If you are going water, I wouldnt worry about a die shrink. If you are on air and cared about noise, then waiting may be best as this thing needs some fan to keep cool while gaming. I would imagine two of these would be fine in a 3 monitor setup (5760x1080)..
Great job on the presentation and review! An overclocked 470 certainly shifts the price/performance grid making it a pretty tough decision at the $300-$400 price range...which is exactly where I think most enthusiasts looking for a full upgrade fall into. Are there any reviews comparing this card or the 480 to a single or SLI GTX285? Been a ton of reviews and comparisons. 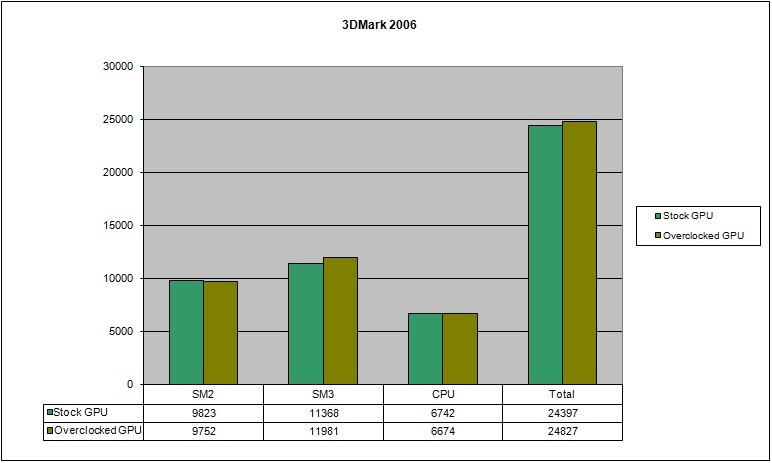 Don't have any bookmarked but Google '480 benchmark GTX285'. Might get lucky.